A salesperson is often on the move—at trade shows, client meetings, lunches and much more. Keeping prospect and client contacts accurately recorded in CRM is crucial to selling—you want to make sure you are reaching the right contacts, at the right companies, at the right time. 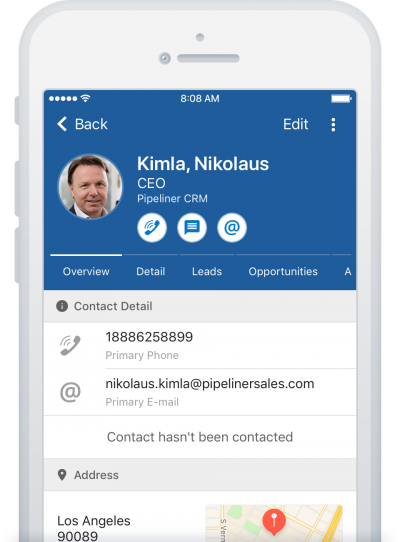 Pipeliner CRM Mobile App contact management brings you the features and functionality of contact management within the desktop version—right from your iOS or Smartphone. For any contact, you can utilize Pipeliner CRM Quick-Views–an informative toolbar showing you the most important information regarding a contact. Simply force touch or long press on the contact you would like data on. Out at lunch, you remember there is a contact at one of your prospect companies that you really would like to reach out to. Contact data is just a click away—and you’re able to do so. You’re at a trade show and run into John Green, a contact who used to work at your client Jones and Company. He loved your product, but has moved to a company that doesn’t have it. You pull out your phone and update the his contact information with his new company—and make it a new lead, too! You’re out and about, and receive a text message from someone asking about a pricing issue. You don’t recall the person right off, so you quickly check your Pipeliner contacts and find the person. You do, and if needed you can also check into the account to make sure you have other fact straight before you answer the query. Check out the most advanced, intuitive and visual Mobile CRM available!